Georgia Southern University’s Health Services held a ribbon-cutting ceremony today for its new campus location at 984 Plant Drive (across from the Nessmith-Lane Conference Center) and provided the public with a first look at the 39,000-square-foot facility. 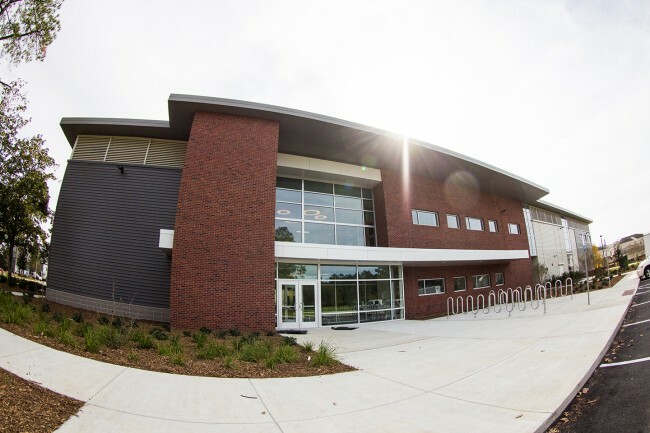 Students may utilize services in the new location beginning Monday, Jan. 11. “What excites us most about this new facility is that it was born out of a legitimate need, not because we wanted to be a showpiece on campus, but because we need to be able to meet the appointment demands and expectations of our patient population. We could not do that in the old facility — literally there was no room to grow. This new facility will now allow us to grow to meet the demand,” said Dr. Brian DeLoach, medical director for Health Services. The contemporary building provides an expanded and inviting check-in and waiting area and boasts a total of 48 exam rooms, 12 of which are dedicated to women’s health, an increase of more than three times the number of exam rooms at its previous location to better accommodate patient needs. The new facility also will feature expanded pharmacy, x-ray, laboratory and immunization areas, in addition to offering new services, including physical therapy, available this spring. The new location is also home to Eagle Eye Care. “The students and the Health Services staff are very excited about this new facility. Our students now have access to a state-of-the-art facility as well as continued quality care for their health care needs. There are very few universities in the University System of Georgia (USG) that have this kind of facility,” said Diane Norris, director of Health Services. An $8.5 million project, the building features sustainable elements including LED lighting in all public spaces, the use of natural lighting and low flow toilets.